We want shipping to be as straightforward as possible for you. For all UK addresses, shipping is only £2.50, or free for orders over £30! Shipping to Europe is charged at a rate of £3.50, or free for orders over £45! And for the rest of the world, we only charge £6, no matter the size of the order! For full details on shipping, see the information below. 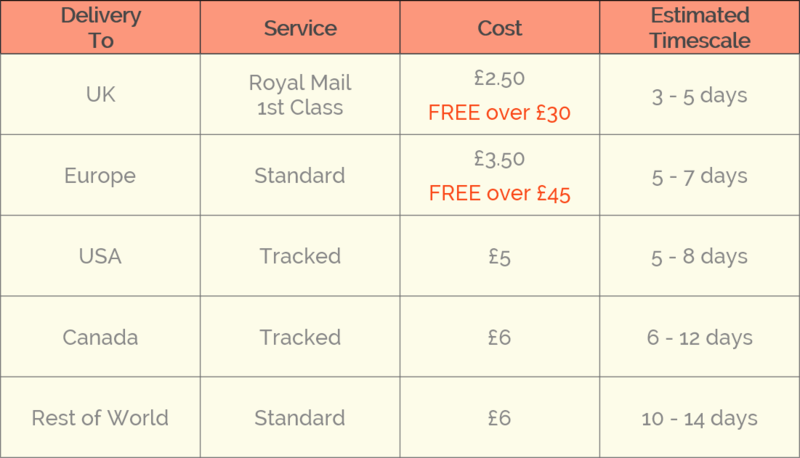 Delivery to all addresses in the UK is free for orders over £30. For orders below £30, we charge only £2.50. We say to allow 3-5 working days for your order to arrive (but it often gets there much quicker!). We do everything we can to get your order to you quickly but some things are out of our control – like strict customs or mail workers on a siesta. your order will be delivered by 1st Class Royal Mail standard delivery service (Monday to Saturday (excluding public holidays). if you order on a Friday afternoon, during the weekend or on a public holiday, we will process your order the next working day. delivery to some UK postcodes can take a little longer (but if you live in one of these postcode areas, you are probably used to that!). during busy periods, our delivery times can increase. your order will be delivered by your local postal service. we will do our best to achieve the delivery timescales quoted, but please do allow up to 21 days for your parcel to be delivered.